The supraTrack Tracking portal can be accessed by selecting the “tracker” on the navigation menu bar and clicking on the “click here to login/Demo” button. 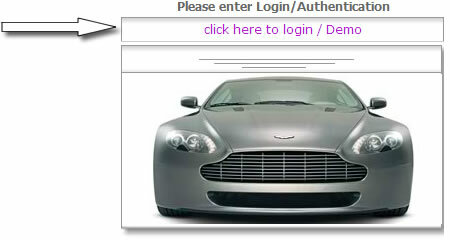 The login window will slide open to reveal the login fields which will prompt you for your Account login credentials as shown below. For the purposes of this Tutorial, we will be using the “demo” account. To begin click the Demo button and the main navigation menu will be displayed as shown below. 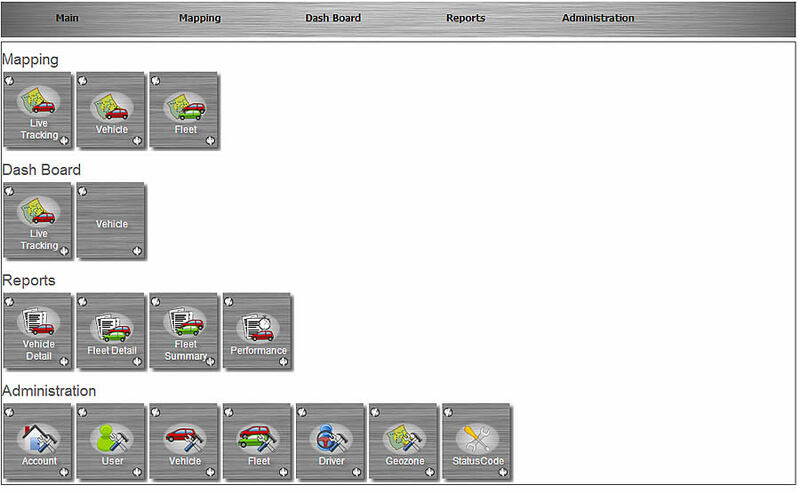 As you can see, the functions are divided into 4 main categories, Mapping, Dash Board, Reports and Administration. Each of the menu items corresponds to the appropriately named category of functions. For simplicity we will skip the Live Tracking Map submenu for now and move on to explain the Vehicle Map and then come back to Live Tracking Map. For now, click on the Vehicle Map submenu link from the Mapping Menu as highlighted below and the following screen will be displayed. NOTE: Your map may be different depending on the date range selected. The right and left arrows just above the calendar will change the month and then you can select the particular day of the month you want. To select a different end date, follow the same procedure as above in the “To” section (blue arrow) of the second calendar to select an end date and then click the Update button (green arrow) to redraw the vehicle/asset history on the map for the selected date range. Moving a bit further down the right hand side, you'll notice the word Replay click on the (play button) arrow just to the right of it and it will begin a replay of the timeframe shown on the map, starting with the first point and continuing through until the final point has been plotted. This is a useful mechanism for quickly seeing the path a vehicle has taken throughout a chosen period of time. The Pushpin Legend in the lower right hand corner defines the colour code of each of the points or "pushpins" on the map. These thresholds are fixed for this demo, but can be set at any level desired at your request from us, or can be keyed off of other parameters in the database such as maintenance status, speed limits of the roads and temperature for refrigerated trucks etc. One final note about the basic map display - if you look in the white space just above the calendar on the right hand side, you'll notice a line that denotes the Last GPS event, telling you the last time this vehicle reported its position to our Servers. On the left hand side of that white space is a box with the vehicle/asset's name (White arrow). Clicking in the box brings up a list of assets that are in your account, any of which can be chosen just by clicking on that vehicle/asset name. Zooming in on the data in the left hand portion of the map, you can see greater detail of the map and the individual pushpins. Placing your cursor over or clicking on any pushpin will bring up the InfoBox as shown above. The InfoBox includes by default the data point [#19], the device name [EngineManagement (normally this will be vehicle ID/Registration)], its status (InMotion), Date & Time, GPS Latitude/Longitude, Speed & Heading, Location (if available), vehicle Battery Voltage, Fuel Level, Coolant Temperature etc. As an interesting side note, if you check the InfoBox checkbox before clicking the Replay button, then each Pushpin will have an InfoBox attached to it, as the trail of Pushpins is rendered on the map. Note that in the centre of the screen, there appears to be a yellow pushpin. Let's zoom in on that area. Placing the cursor on the yellow pushpin, we see that the status is reported as "InMotion” and Speed is reported as 20.5km/h heading east (E). Additionally, here the system reports a reverse-geocoded street address as Ahodwo Circle. The second is to utilise the Location Details, by clicking the Show Location Details link at the bottom of the map. Reading down the Date/Time column, you can see that this vehicle/device is configured to report a fresh GPS reading to the server every 15 seconds. Now that we understand how the Vehicle Map works, we will continue the discussion with the Live Tracking Map that we skipped earlier but before doing so let's pay attention to the red circle as shown in the screen shot below. It appears in all the Mapping pages and clicking on the 3 arrows or any point within the blue vertical strip will expand the map to fill the width of the page. The Live Tracking Map visually looks, works and behaves very similar to the Vehicle Map with minor but very significant differences. Unlike the Vehicle Map, the Live Tracking Map does not permit different dates and time selections as only the latest device location is selected by default. Only the current and latest location of the vehicle or asset is displayed on both the Map and “Show Location Details” meaning only one pushpin will be displayed at all times. To enhance simplicity and experience, the Dashboard has in addition the functionalities of vehicle Mapping and the incorporation of speed dials or gauges to simulate a real vehicles' instrument cluster as found in the dashboard. The vehicle/asset selection, date & time selection from the calendar, events replay etc are all the same as the Mapping. The "Live Tracking Dashboard" also looks, feels & works in the same manner as the "Live Tracking Map" but with the addition of the speed dials. To simplify this Help/Tutorial, I will not discuss the functions that the "Mapping" and "Dash Board" share in common so the focus will be on the actual dials and features that are exclusive to the "Dash Board"
Displayed below is the instrument cluster as seen in the dashboard with a legend mapping out the functionalities and descriptions of the individual gauges. From the above dashboard we can see that at 09:43:24 on 13 May 2013 the vehicle “EngineManagement” was in motion and the drivers’ foot had pressed the accelerator pedal down (which has direct correlation with the throttle) thereby opening the throttle just over 30% [0% means pedal is at rest (up) & 100% - pedal all the way down]. A very healthy 12V vehicle battery with current voltage of just over 14V meaning that the alternator is at peak performance. Used fuel since the engine was turned on is zero whilst the fuel level and coolant (water) temperature are 20% and 95°C respectively. The vehicle is travelling at 49km/h heading south (S) and the Cam Shaft of the engine is spinning at a speed just below 2000 revolutions every 1 minute (RPM) whilst the current mileage on the clock or odometer is at 232312 Km. The Mass Air Flow Rate which is responsible for the air intake (oxygen to fuel mixture ratio) is currently sucking in just over 15 grams of air every 1 second whilst the Engine Load is at respectable 23%. The brake pedal is at a comfortable rest of 0% reading. In the replay of past events if Engine faults were detected whilst the vehicle was in motion it will be displayed at the exact time, down to the second, as it happened, the way & manner the vehicle was travelling (speed, RPM, Engine Temperature etc), giving you an idea what could have led to the failure. The Reports Menu contains 4 submenus that is Vehicle Detail Report, Group or Fleet detail Reports, Group/Fleet Summary Reports and the Performance Reports. These reports are currently formatted as HTML, Excel, Email etc. It should be noted that any data field that exists in the data table is capable of being added to a specific report. The Vehicle Detail Reports Screen can be accessed from the Reports Menu and appears as shown below. Here we have the same nature of controls as on the Vehicle Map screen, allowing us to specify for which vehicle we want the report on, the date range for the report and then which report we want to see. This particular report menu shows the Event Detail, as well as other possible available reports. Using the capabilities of the report generator, additional report selections may be added. All received events are reported in the Event Detail Report. In this application, the location is reported every 15 seconds and events that are reported are Start, Stop, and InMotion. In a more complex application, other Status indications might include Digital I/O State (such as ignition ON/OFF), Idle, Fuel level or Terminal Arrival/Departure. Each event reports Time, Date, Status, Latitude/Longitude, Speed, Heading, Altitude, Odometer, Total Fuel and Address or Location. Unlike Device Detail Reports, the Fleet Summary Reports are focused on either a group of vehicles or an entire fleet. They are not meant for a specific vehicle, as they present information that is only useful when viewed across a group of vehicles or assets. The structure of the report selection mechanism here is identical to that found on the top level Vehicle Detail Report screen. The date selector is the same as what we've seen throughout all of these screen shots and then there's the list of available reports off to the right. Note just above the calendars is the Group Selector field, where either the “All” group can be selected (which corresponds to the entire fleet), or if there are sub-groups defined, these can be selected as well. As with the Vehicle Detail Reports, additional customised reports based on Vehicle Groups can be added to the Fleet Summary Report list at your request. The Since Last Check-In field is the amount of time that has passed since the device has last checked in with our servers. This may not necessarily mean that this is the time the device last sent an event, only the last time the device communicated with the server (at which time it may, or may not have sent an actual event). You’ll notice that this sample data was collected some time ago. As was the case with the Vehicle Detail Reports, we can click on the Map link and get a pop-up sub-window that will display each of these vehicles on a Vehicle Group Map. The primary focus of Driver Performance Reports is to provide the fleet manager with meaningful information that pertains to the utilisation of the fleet assets. Are the vehicles being driven in a safe manner (i.e. adhering to relevant speed limits)? Are vehicles being used effectively or is excessive time being taken at stops? The date selector is the same as what we've seen throughout all of these screen shots and then there's the list of available reports off to the right. Note just above the calendars to the upper left is the Vehicle selector field (red box) where the individual vehicle or asset can be selected. As before, I'll start at the top of the list on Speeds over [72km/h] and step through the list. The Speeds over [45mph or 72Km/h] report is designed to give the fleet manager information on a vehicle basis, showing if, when and where the specific vehicle exceeded the selected speed threshold (from the pull-down menu). The report presents Date, Time, Status, Latitude/Longitude, Speed, Heading and Address/Location in the tabular format. Here we can see each instance when the selected vehicle exceeded the selected threshold. The speed violation reports are useful for determining if a specific vehicle is being regularly operated in excess of safe speeds or speeds deemed inappropriate according to company policy. With concrete data substantiating the behaviour, it is then possible to effect corrective action with the driver BEFORE an incident occurs on the road. This report depends on the reverse-geocoding service providing a “posted” speed limit at the location of the vehicle. For the purposes of this report, we have selected Device “EngineManagement” as it has made several stops during its trip. There is a lot of information to absorb in the Driving/Stopped Time Summary Report. It is designed to give the fleet manager detailed information (on a vehicle basis), showing how much time was spent driving, how long the transit time was between stops and how much distance was covered. Additionally, the report shows how much time the vehicle spent stopped, what the duration of the stops were and how many stops there were and what the locations were. The fields presented in the report are Start Date, Start Time, Driving Elapsed, Driven Mileage, Stop Date, Stop Time, Fuel Economy (if equipped), Latitude/Longitude, Address, Idle Elapsed time and Stopped Elapsed time. This report can provide full detail on time spent driving and time spent at stops. This allows the fleet manager to pinpoint where stops are taking longer than necessary or unnecessary stops are being made. Additionally, by reviewing drive time and distance between known destinations, it can be determined whether vehicles are being used in the most efficient manner. The last 2 columns in the report are Idle Elapsed time and Stopped Elapsed time. Unless the on-board vehicle device is equipped with ignition sense, the values in these two columns will always be the same but with the ability to determine that the ignition is on while speed is zero, this report can also provide the fleet manager with valuable data on excessive idling. Excessive idling can be a large cost centre, frequently unknown but easy to correct with the appropriate data available. This is just one more piece of information the Driving/Stopped Time Summary provides. The Administration functionality has been limited for the Demo account and most functionality has been disabled but you can view without effecting any changes. Having said this most of the System Administration will be done by us according to your request but for the purpose of this tutorial I will explain what can be expected. By selecting Account Adminfrom the Administration sub-menu, the Edit Account Information screen will be displayed, as shown below. This is where account-wide contact information, and units of measurement information and format can be made. After making any edits on this screen, it is important to press the Save button at the bottom of the screen to save those edits (a message should then be displayed at the bottom of the frame to indicate that the information was saved). To cancel changes, press the Cancel button. By selecting User Admin from the Administration sub-menu, the View/Edit User Information screen will be displayed, as shown below. On this screen, you can review all of the defined users in the system. -- User ID, User Name, Contact Name, Contact Email, Time Zone and whether the user is Active(ie. allowed to log-in) and date & time of Last Login. As you can see from the list below, it isn't necessary to populate all of these fields when setting up new users. If all of the fields are not defined, the table in the User Information Summary will just have some gaps. It is possible to access the details that have been defined for any user in either View or Edit mode. All of the details are the same in these two modes, with the primary difference being unable to edit in the View mode. There's also the ability to add new users using the Create a new user, in the field at the bottom of the screen (green arrow). The new user ID must be all one word and in lower-case (small) letters or can be the staff number but no upper-case (capital) letters. To edit user information, click the Edit button (blue arrow) to open the Edit window. Within the View/Edit User Information screen, users are defined as active or inactive, their password is defined (this can changed by the user at later date), all contact information is entered (if desired) and group authorisation assignment is made. The user's access to specific functions while logged-in is controlled by the selection of the Default ACL (Access Control List) and the overriding selections in the User Access Control list. Note: ACL refers to Access Control List. As can be seen in the list above, Default is selected for all visible functions and to the right of the drop-down list, that default access control right is specified.